I just watered all of my herbs and tomato plants and now I have blackberry stains on my feet from walking around on our deck barefoot. We have blackberry bushes taking over our back yard… and dying the deck a polka-dotted violet hue. At first I didn’t have the heart to trim the bushes back away from the deck, but after the slipping and sliding episode this AM, I’m reconsidering. Gracie got a bee in her bonnet to make these grilled cheese roll-ups (some people call them grilled cheese rolls) yesterday for our before-dinner appetizers. She saw something similar online, and now she has ideas for a bunch of different fillings and dipping sauces to try next. The classic grilled cheese is where she started, and they really did turn out yummy! This is a great recipe for kids to attempt if they have some experience using the stove, and with parental supervision, of course. 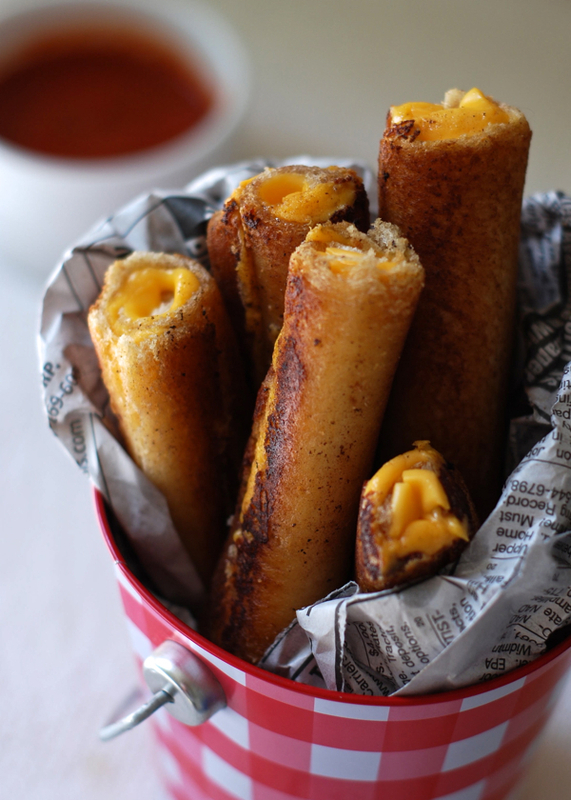 Whether you call them grilled cheese roll-ups or grilled cheese rolls, I think you’ll agree that they taste AMAZING! Heat a couple Tablespoons butter in a skillet over medium heat. Place the roll-ups in the butter once it’s barely sizzling. Using a spatula, roll the roll-ups around in the butter. Gently flip and roll until all sides are golden brown and cheese is melty. Dip roll-ups in sauce! YUM! Woah this is AWESOME!!!! You are so talented Melissa! Plus the styling is impeccable! That is AWESOME Melissa! How long how you been a food photographer? I am self taught, but I went to art school. Being creative is half the battle! Keep up the awesome work! This was awesome!!! So easy and so good! I could eat ten of them. Thank you, thank you. Congrats Gracie…..you’ve got a winner here! Hi there, Eleanor! I’ll tell Gracie you approve! 🙂 Thanks so much for stopping by! Love it. I’m going to make these with my little one who craves grilled cheese every few weeks (her words) 🙂 She’ll love them. Thanks, Gracie! Hi Danielle! Enjoy, Munchie! 😉 XOXO Thanks for stopping by! This does sound like a great kids’ lunch! Or…for thirty-one-year-old 😉 I love the idea of using different dips, too- like pesto! Melissa, this is such a fun idea! I have to make these with The Bug. Pinning and sharing! I can only eat Toasted Cheese sandwiches with Tomato soup & these rolled up are so much easier to dip in the soup! This is a wonderful change that works amazing. Thanks for this recipe! Wonderful idea, i just cant seem to get my bread to work correctly for me. When i try rolling up the bread it breaks with every roll and the cheese is exposed. I tried using water to seal it over the cheese but there doesnt seem to be enough bread to cover the cheese. I tried using less cheese and it still happened. Any suggestions? Maybe i should slightly melt the cheese on the bread first then try to roll before putting it in the skillet? Hmmmmm, you must not be using soft/big enough bread slices. Also, make sure you use soft, American cheese slices for this. regular cheddar won’t work. Try a cheese spread works great just roll out bread, spread the cheese and grill!! Would 12 grain bread work? It’s healthier and I hate the way white bread sticks to the roof of my mouth. Thanks for the reply, I can’t do it until I do food shopping. I don’t have American cheese. I’ll let you know. This just got posted on facebook by one of my friends and I fell in love with the idea instantly. I have a 22 month old who loves grilled cheese but usually ends up pulling the sandwich apart. He also loves to dip anything in anything. I’m going to make these for him today and I already see this being a huge success, so thank you!!! It’s a whole new spin on our lunch time. I’m so excited!!! Hi Daisy! Yay! I’m so glad you like the recipe 🙂 Enjoy. What a cool idea! I might add some diced jalapenos to spice it up! Thanks, I’ll be trying this one! Pinning! Hi Lillian! I’m so happy you like the recipe. Love your idea. Jalapenos would be awesome in this…or you could use pepper jack cheese instead of the American. 😉 Enjoy, and thanks so much for stopping by and commenting. Try using coconut oil instead of butter. I use it on my grilled sandwiches and they are crisper and the sandwiches taste better without the heaviness the butter imparts. Thanks for the tip, Patti! i can’t wait to make these with my grandkids..i love grilled cheese, but the outside part is better..now i can have the outside all around..oh and by the way,, you rock..keep rockin all these recipes..
Just found you ! Great idea for the grilled cheese, and the photos are gorgeous! I just came across your wed page through a friend on Facebook and read it and some of the many recipes! I am very interested in having a subscription to your webpage and news letter please send me one!! Don’t know if anyone else said it, how about dipping in Tomato Soup. I made this today for my grandchildren! They absolutely loved them! Instead of marinara sauce I used ranch dipping sauce, it was really good!!! I use mayo on the bread and extra sharp cheddar with fresh ground pepper. Sounds awesome, Hirsch! 🙂 Thanks for stopping by! Will definitely be trying these and just curious what other if any other filling have you tried with these?? Just popped into my head that they would also make great P&J roll ups of course without the toasting!! I was wondering if these could be frozen after cooking and warmed up in the microwave or oven after being frozen. Thinking I might make for my 92 year old mom in love who can’t use the stove but can use microwave or toaster oven. Just made Garden Fresh Tomato Soup today, these will be lovely dipped in it. Probably have to make a couple with Swiss also, it is my cheese passion. I made this for the first time today. Mine did not come out looking like yours did! But it was still delicious!!! I will keep practicing!!! Thank you for this great idea! I used to drain a can of asparagus spears and slice some Velveeta, put one spear and slice of Velveeta and roll up and fry, slice in smaller pieces and hot d’oeuvres are ready. Love this little cheesy roll idea!! … my family likes to dip they’re grilled cheese in tomato soup and I’m definitely going to try this for lunch this weekend… and maybe even try the ham and Swiss!!!! Making these this weekend with my granddaughter for Valentines Day. She will LOVE them! Melissa, this looks divine! How creative to use the bread as a wrapper! The fillings are endless, and the possibilities are mind boggling! These are awesome! Can’t wait to make them with the grand kids. Besides the cheddar, I could see using mozzarella and having the marinara dip. You can make sweet ones, & savory ones. Maybe brown Italian sausage and add it with mozzarella. Wonder if they would hold up? Nutella and strawberries, too. Apple or cherry pie filling? Lol…Thank you for the ideas. What a fun thing to make for movie night. I’ve up graded the soup to a basil tomato heartier soup stocking several cans of progresso brand in the pantry. Those cans are just waiting for this chilly day to partner with that grilled cheese sandwich. It’s time to up grade the sandwich too! so from flat and boring to this roll up treat although I don’t have any marinara sauce on hand right now, I’m sure these will dunk just fine. Thanks for the wonderful recipes, So many are great, depends on your likes as to what you try of course. I am sort of computer illiterate I guess, I am wondering if the pictures can be made smaller, I enjoy them, but I copy them and it takes so much paper and ink. If I print them smaller, I can’t read them as my eyes aren’t to good, or is there a way to skip the pictures which I hate to do, I enjoy seeing them. Thanks, keep up the good work.